The attorney general says to “stay tuned” for his efforts on black market marijuana, the Latino Caucus unveils its big priority bills and more in our weekly roundup of news from Sacramento. Soon after Sacramento police officers killed an unarmed Stephon Clark, they insisted the shooting was legal. “Even as tragic as this event is, we cannot ignore the fact that the shooting was legally justified under the law, within police policy, and in accordance with training,” Timothy Davis, head of the Sacramento Police Officers Association, wrote on Facebook. 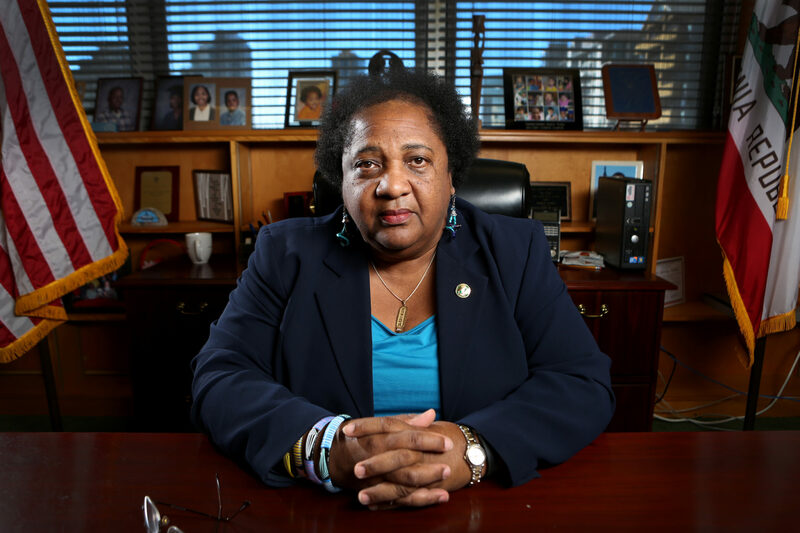 A bill introduced by San Diego Assemblywoman Shirley Weber this week would change the law — narrowing the circumstances in which officers could kill. The current standards deem police use of deadly force lawful if it is “objectively reasonable,” which has proved to be a very high bar for prosecutors. In San Diego, the district attorney did not find a single instance among 155 officer-involved shootings between 2005 and 2015 in which a police officer should be charged, according to a database compiled by inewsource. Under Weber’s bill, deadly force would be justified only if the officer was in imminent danger of bodily harm or death, and if there was no reasonable alternative, like verbal warnings or non-lethal de-escalation tactics. A shooting would not be considered justified if an officer’s negligence contributed to the circumstances that led to the shooting. Weber said that though there are certainly situations in which police have no choice but to shoot, too often they resort to violence even when there’s no immediate threat to their safety — and that it happens disproportionately when the suspect is black. Weber said she’s troubled by the fact that police officers do know how to use de-escalation techniques yet they often use violence as a first resort when responding to incidents in minority communities. She pointed to the fact that police were able to arrest the mass shooting suspect in Parkland, Fla., without shooting him. “Our officers do know how to de-escalate and they do know how to use other strategies. They just don’t use them in black communities,” Weber said. The bill, of course, will face an uphill battle in the Legislature and certain opposition from police unions. It’s nothing that Weber, who has introduced numerous police accountability measures during her tenure, hasn’t faced before. I reminded Weber of a quote from a police union representative from 2015, after she passed a bill requiring police to collect data on people they pull over. “There is no racial profiling. There just isn’t,” that officer told the Los Angeles Times. Brian Marvel, president of the Peace Officers Research Association of California and former head of San Diego’s police union, wrote on Facebook that he hasn’t read the bill (the text hasn’t been released yet) but that he believes it’s based on guidance from the Police Executive Research Forum. “You will notice PERF places no value on officer safety and survival. …This bill is political correctness run amok!” he wrote. Weber said she hopes to work with law enforcement officers to address their concerns and is open to their feedback. But she’s not willing to water it down in a way that renders it toothless — by changing it to a bill to simply study the issue, for example. “We’re not going to solve the problems of California in this area of policing, and we’re going to continue to seae unfortunate things happen if we do not confront the monster in the room: the fact that there is racial profiling, and there’s a different type of policing that occurs in various communities,” Weber said. Also this week, Berkeley state Sen. Nancy Skinner announced a bill that would open up some police records to public view. California has some of the most secretive police discipline policies in the nation. The bill would require that investigations into police shootings be made public. State Senate Pro Tem Toni Atkins, a San Diego Democrat, was among the sponsors of a bill introduced Monday to crack down on counterfeit goods, like luxury purses and cigarettes. Underground economies make up an estimated $60 to $140 billion in California. One segment of retailers missing from that list: pot. California Attorney General Xavier Becerra said that when it comes to the black market for marijuana, the public should “stay tuned,” KCRA reported. Weed became legal on Jan. 1, but sellers need both a state license and local permits. As of mid-March, California regulators had sent more than 1,200 cease-and-desist letters to illegal dispensaries and delivery services that were advertising their businesses online. About 375 of those letters were sent to people in the San Diego region (nine of which were sent in error to legal dispensaries in San Diego). Local law enforcement officials welcomed the help, but some remain skeptical that a warning — and a threat to ban illegal shop owners from a license down the road — would amount to much. In unincorporated Spring Valley, illegal shops have been popping up faster than cops can shut them down. The intervention of the state’s top prosecutor could change the incentive. Becerra’s office did not respond to a request for more information. Becerra has simultaneously vowed to protect the state’s marijuana laws from federal interference and called on Congress — alongside 18 other attorneys general — to establish a banking system for marijuana businesses. The California Latino Legislative Caucus — headed by two San Diego legislators, Sen. Ben Hueso and Assemblywoman Lorena Gonzalez Fletcher — will focus on legislation that expands access to education, health care, jobs and housing for Californians. During a press conference Wednesday to introduce the 20 priority bills, Hueso said that while the caucus — and the number of Latinos in the state — has grown significantly in the 40 years since the group was formed, Latinos often struggle more than the overall population when it comes to income, access to health care, housing and educational achievement. The list of bills includes one by Hueso that would expand court interpretation services, a bill by San Diego Assemblyman Todd Gloria that would encourage low-income housing in transit corridors, a bill from San Gabriel Valley Sen. Ed Hernandez that would prohibit work requirements in accessing Medi-Cal and a bill from Gonzalez Fletcher that would certify janitors to serve as peer educators to provide training on sexual harassment prevention in the workplace. Many of the bills seek to help immigrants throughout the state. A bill by Gonzalez Fletcher would provide retroactive high school diplomas for deported students. Other immigration-related bills would provide funding for immigration services for recipients of Temporary Protected Status, provide assistance for students in filling out college financial aid and Dream Act applications and require high schools to have resource liaisons for Dreamers and set up a task force to come up with ideas for temporary work programs for the service and agriculture industries, which often rely on unauthorized labor.